Find out more about our Patagonian adventure in an information session on Saturday, Sept 26 at 6:30pm at the Mountaineers Seattle Program Center. Most people have heard about the granite towers and lakes of southern Patagonia, but the peaks and lakes of the northern Patagonian Andes are a relatively undiscovered treasure for hikers and backpackers - a treasure often mentioned by local guides as their favorite place to backpack in all of Patagonia! Get away from the crowds and experience this gorgeous and unique area with a group of like-minded adventurers from the Mountaineers! What does the trip deliver? 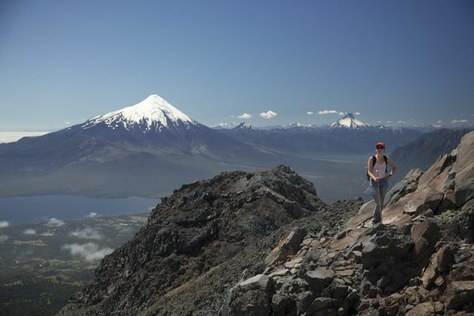 Walking high panoramic ridges among jagged peaks from the fun ski town of Bariloche, Argentina to the flanks of the massive Tronador volcano in the northern Andes of Argentina, with glaciers cascading from far above and a hundred blue lakes below. Camping by picture-perfect glacial lakes surrounded by lush forests. Exploring the remote Cochamo valley, the ‘Yosemite of Chile’ out of a cozy refugio located right below the towering granite walls. Guides will accompany us the whole way as many of the trails are 'off the beaten track'. Food will be provided and carried for us. Carry a backpack with your overnight gear, or hire a porter so that you only need to carry a daypack. This trip will be in two parts. Sign up for one or both! Find out more about this amazing, unique adventure and sign up below, or come to an informative presentation on the evening of Saturday Sept 26 at 6:30pm at the Mountaineers Seattle Program Center to see lots of drool-worthy pictures and to learn more.